Lustica Peninsula is where you'll find the real Montenegro - a simple traditional lifestyle that hasn't changed in centuries. There's something alluring about Lustica Peninsula. It calls you back time and time again. It's the kind of place where summer days on the beach stretch on endlessly. Where summer holiday memories are made. Whether you spend a day or a week here, you're bound to be entranced. But Lustica isn't all about the slow life. It's also home to some trendy beach clubs where you can spend the days tanning and the nights partying. Whether you're after a getaway or a beach party heaven, on Lustica you always have the feeling that adventure awaits around every corner. Lustica is a peninsula that creates part of the Bay of Kotor. One side of the peninsula is inside the bay and the other is on the Adriatic Sea. It's one of the few places along the Adriatic coast that hasn't been developed - yet. But there are plenty of plans for development and on the Kotor Bay side of the peninsula there are new villas going up every week . This makes it a wildly variable place. There are villages that have barely changed in 100 years, and just up the road you have some of the most popular beach bars in Montenegro. If you've got a day to spend on Lustica you can either hit the beaches or take a tour around the whole peninsula. And if you're looking for a true summer getaway, there are some gorgeous places to stay. 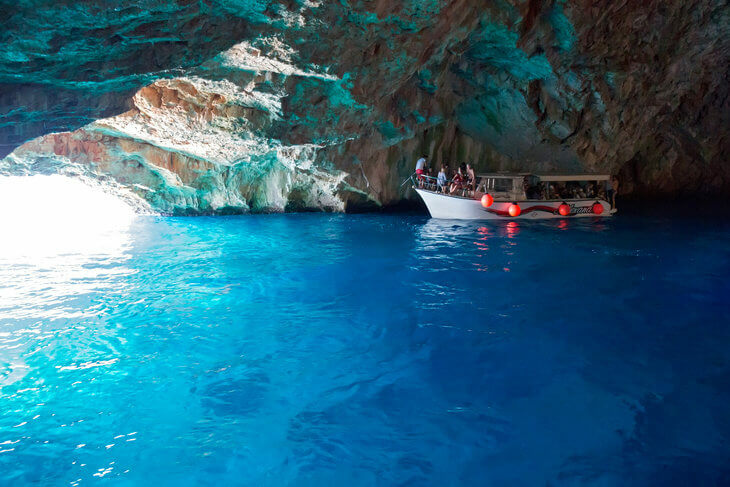 The Blue Cave is Lustica Peninsula's most popular attraction. The only way to get there is by boat or kayak and once you're inside you can swim in the cave. It's called the Blue Cave because of the iridescent blue that's reflected up from the sandy bottom onto the walls. Tivatska Salina is a nature reserve in the corner of Tivat Bay where Tivat joins with Lustica Peninsula. The reserve is an important rest stops for migrating birds heading south, along with another former salt pan in Ulcinj and Lake Skadar, and has been a protected area since 2008. There are 114 bird species, 109 of those protected in some form, at the salina. You can take a walk through the reserve and climb the lookouts to spot them. You're likely to spot gulls, ducks, herons and hawks among others. There's a small information booth and table and chairs set up at the entrance. It's a great place to bring kids and I'd recommend bringing a pair of binoculars too. See Mamula before it's gone! Mamula is a piece of Montenegro's history that's scheduled to be turned into a hotel in the near future. 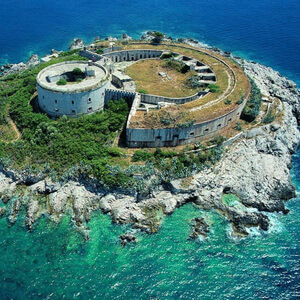 The island at the entrance of Kotor Bay is an Austro-Hungarian fortress that was used as a prison during the world wars and it's been abandoned and left to ruin. At the moment you can can still explore the fortress and see island free of charge. It's a fascinating place. This boat tour will show you the island and a good part of the Bay of Kotor. * You can substitute any activities for a coffee break at Ribarsko Selo in Zanjice or in Rose village. 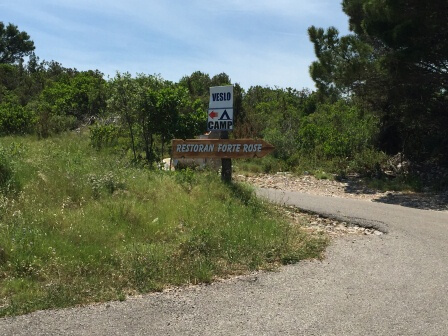 Stop for lunch at Ribarsko Selo, in Rose village or Admiral in Herceg Novi. Discounts for groups of 5 or more are available - please enquire via the booking form. What's included: 1 bottle of local wine or prosecco per two peop.e, traditional ham and cheese plate, snorkels and masks on half or full day tours. Towels and ponchos available on request. Tour guide - €60 for the Panoramic Tour, €80 for the Half Day Tour, €150 for the Full Day Tour. Tides, swell and weather may make docking on Mamula or entering the caves difficult or dangerous. In this case, alternatives will be suggested by your skipper. I highly recommend taking a tour to see Mamula Island if you can. It's a fascinating ruin of a former prison from WWII. Unfortunately it's set to be developed so you won't be able to visit it for much longer! This tour takes you along the Bay of Kotor coast to the island, which sits at the entrance to the bay. You have 45 minutes to visit the island before you get back on the boat for a drinks and sunset photo stop. You can also extend the tour and stop for dinner at a local restaurant. Start point: Porto Montenegro, Tivat. Elsewhere in the Bay of Kotor on request. What's included: Bottle of local wine or prosecco per two people, traditional ham and cheese plate, fuel, skipper. Towels and ponchos are available on request. The boat may not be able to dock on Mamula in certain weather conditions. If you can't dock, the skipper will take you on a panoramic boat tour of the area instead. Getting off the boat onto the island may be difficult if you have mobility issues. From May through to October there are boats heading back and forth all day from Herceg Novi marina, below the old town. These boats offer full day tours that take you to the Blue Cave, Mamula and to Zanjice or Miriste beach for the afternoon. They're very inexpensive tours, but in summer there's likely to be standing room only and you'll be blasted with Balkan pop music so keep in mind you'll be getting the true Balkan experience! Local's Tip: Always remember which boat you came across on and ask your skipper what time the last departure is so you don't end up stranded in the evening. Price: €6-10 per person return. Lustica Peninsula is one of the last untouched places on the Montenegrin coast. This tour will pick you up and take you to experience the essence of Lustica: olive groves, fresh cuisine, religion and the simple life. You'll visit local olive mills and learn about olive oil production. A three-course meal of local specialties is also included. Lustica's main attraction are its fabulous beaches. Some are tiny and pebbly. Some are big and sandy. Some have cocktail bars. And some are wild and rocky. 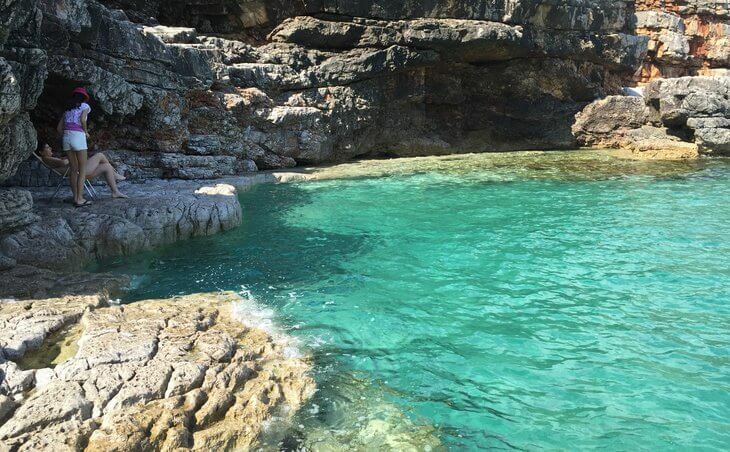 It's only 15-20 minutes from Kotor and Tivat to some of the most popular beaches, so if you're keen to stay in the Bay of Kotor but want to have nice beaches close by, it's worth taking the short drive out here. This is also the only place in Montenegro where you can still find beaches all to yourself, even in summer - I'll show you where! You can also find plenty of beaches that are accessible by car with just a handful of people on them - even on the weekend. Oblatno is about 15 minutes from Tivat and is home to trendy Almara Beach. This is a favourite spot with yacht owners from Porto Montenegro in Tivat and you'll see them anchored off the beach. 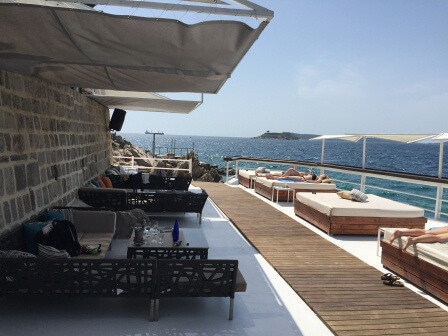 There's a shallow, sandy beach, loungers, a bar with a dj, restaurant and in-water loungers. This is the kind of place you can come to spend the day sipping cocktails and swimming and carry on the party into the night. But it's not just for adults. Lots of families come here too and your kids will love jumping off the floating pier, digging in the sand and exploring underwater. You can hire loungers either on the deck on on the beach. There's also a free space at the end of the beach where you can park your towel for free. 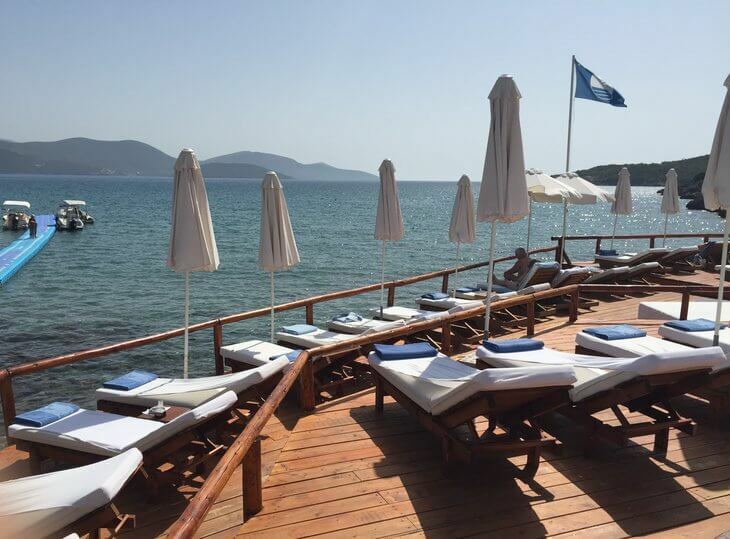 Almara Beach Club's loungers and floating pier. 10 minutes out of town, next to Solila Reserve, you'll find trendy Movida beach with its small marina. There's a restaurant on site and you can hire loungers and umbrellas. Not just a daytime venue, at night Movida morphs into an open air party venue with bands, djs and dancefloors. 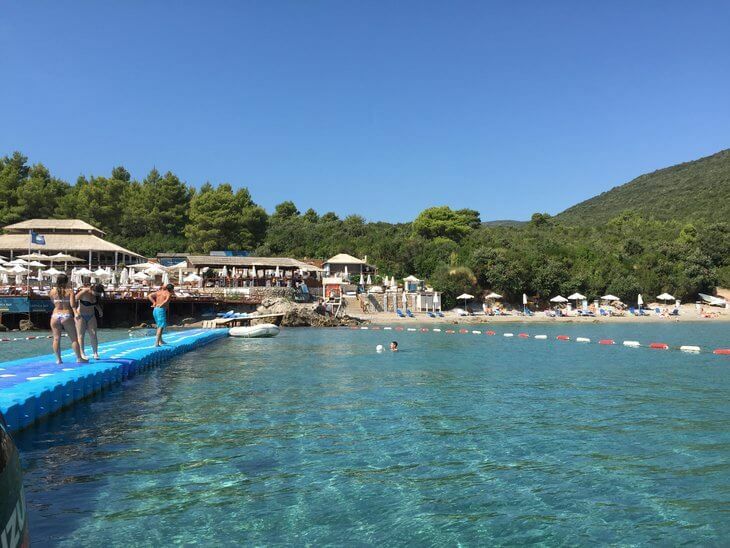 Blue Horizons Beach is a blue flag beach about 15 minutes from Kotor or Tivat. It's called Plavi Horizonti in the local language. It's also sometimes called Przna or Przno in travel guides and this confuses people because there's a Przno in Budva. No one here calls it Przno, so you're best to stick with Blue Horizons. It's a large bay with a shallow, golden sand beach and it's ideal for small kiddies. You can hire little pedal boats, eat at the restaurant and bask in the warm waters all day long. There are loungers for hire, but most of the beach is free and parking in an olive grove costs €2 per day. There used to be a hotel behind the beach which has been taken down. This area will be developed into a 5 star resort, so it might become as exclusive as Sveti Stefan on the Budva Riviera. We hope not! See on map. 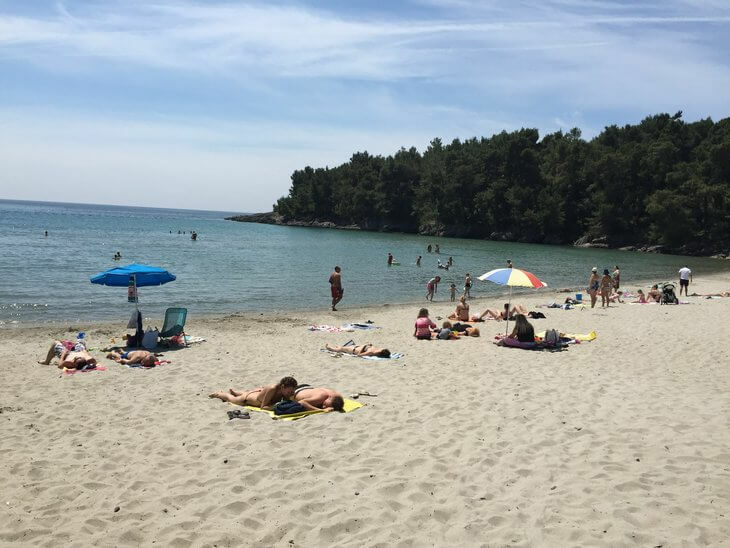 Zanjice Beach is at the tip end of Lustica and it's one of Lustica peninsula's most popular beaches. Throughout the summer months, boats full of tourists come here from Herceg Novi. It's much faster to get there by boat from Herceg Novi than by driving around the bay, which takes around 1 1/2 - 2 hours. Zanjice has restaurants and cafes and the beach is shallow and pebbly. 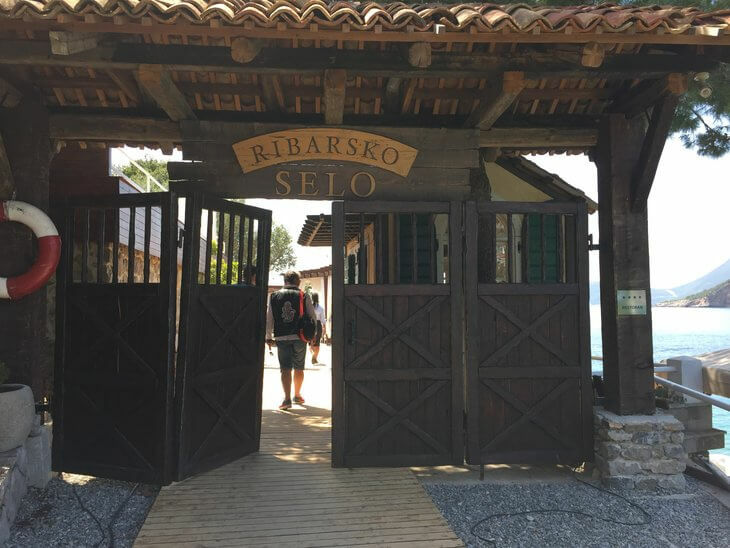 There's an upmarket restaurant with sun loungers called Ribarsko Selo, but there are also ordinary restaurants and ice cream stands. See on map. Miriste Beach is a cove, a bit smaller than and right next to Zanjice Beach. 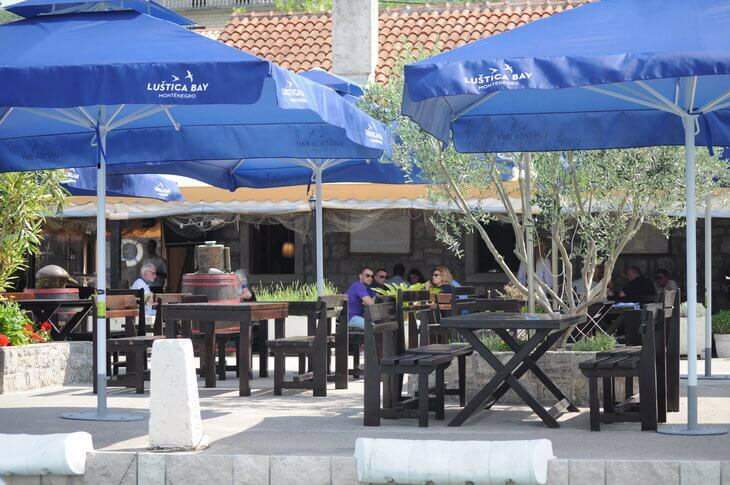 There's an excellent restaurant right on the waterfront that serves classic Montenegrin seafood and meat dishes. At the tip of Miriste you'll find Arza fortress, one of two Austro-hungarian fortresses that protected the entrance to the Bay of Kotor. Although the fortress is now out of use and you can't get in, it's an interesting spot and if you're looking to get away from the crowds, you can head over here and find rock pools and more secluded spots. See on map. A waterfront, sunset dinner on Miriste Beach just can't be beaten. 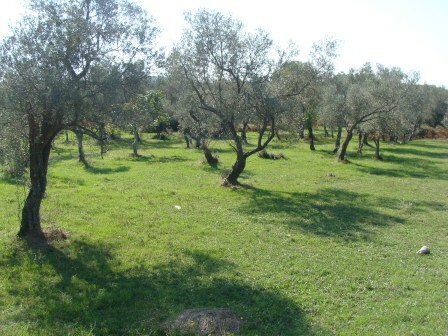 Kamp Begovic is a campground in an olive grove between Uvala Veslo and Tijesna Luka. 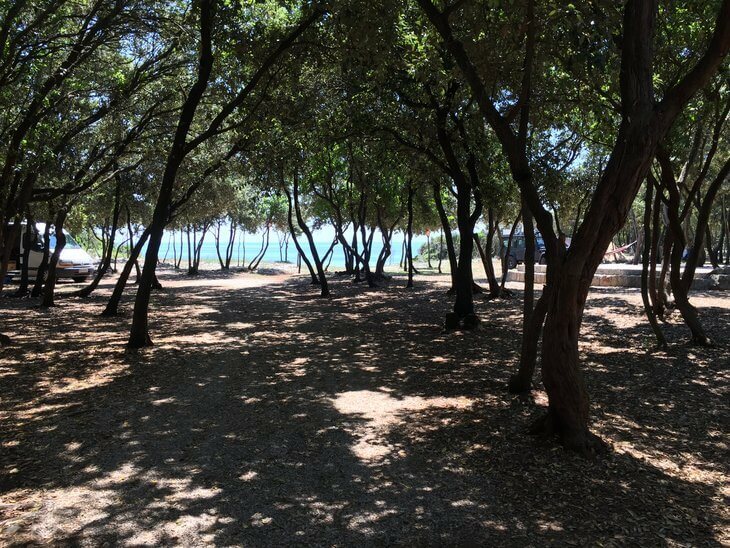 When arriving by car you'll park in the shade of ancient olive trees and then head down to the cliffs to the water. The cliffs are ideal for jumping off of into the water and the rocks often create warm rock pools for basking in. You'll want to bring snorkelling gear here and also watch out for sea urchins on the rocky bottom. It's not an ideal place for small children for that reason. Blue Horizons is a better spot for little kiddies. The camp has a little kiosk with refreshments, a toilets, showers and plenty of shade under olive trees for a picnic and games. Campers and tents are welcome here. Camping costs €20 per person per night, which on the high side for Montenegro but it's a very special spot and the facilities are excellent. See on map. Dobra Luka bay that we visit often. There are two beaches you can swim to and there's never anyone there. There's also a beach that we've found you can easily get to by car. It's a small pebbly beach and is never very busy. It's about 20 - 25 minutes from either Tivat or Kotor and sometimes it's completely empty even in the height of summer - on the weekend! I have the feeling there might be a bounty on my head for telling the world about this beach, but that's why I started this website - to share the best of Montenegro with you! See on map. 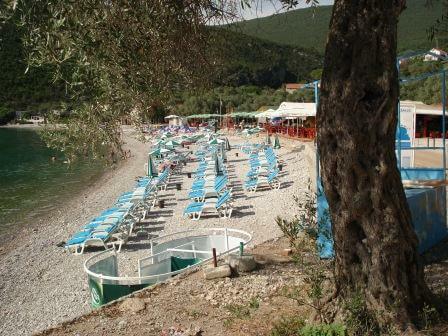 There are two beaches at Dobra Luka that are usually deserted. There is a little beach called Tiny Beach close to Oblatno. There's also Robinson Crusoe Beach which is a little pebble beach with a sandy bottomed cave. The cave has two entries so you can go in one end and out the other. Tiny Beach in summer - not a soul in sight! Ssshhhh... don't tell everyone about these secret hideaways! When you go, make sure you take some snorkelling gear or goggles with you so that you can get the most out of the extraordinarily clear water. 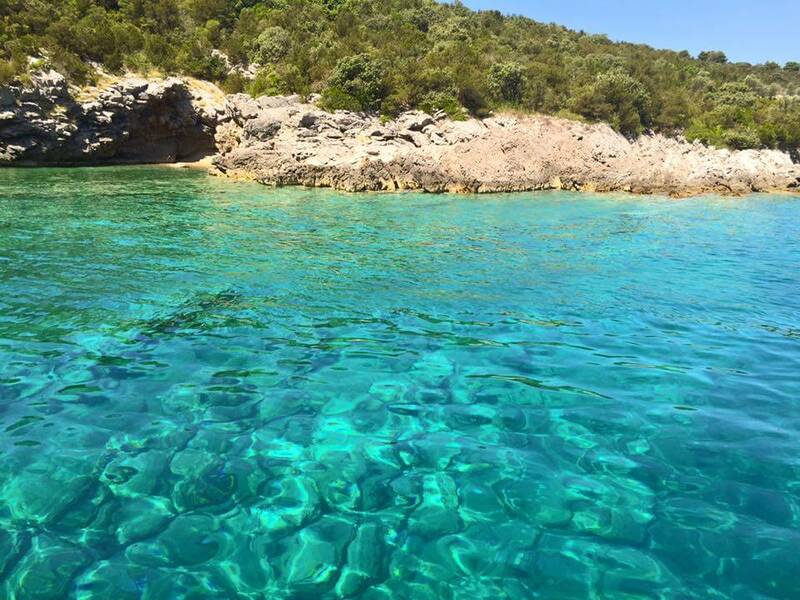 The water around Lustica Peninsula is crystal clear and perfect for snorkelling and diving. Just watch out for sea urchins on the rocky bottoms! If you're looking for a super-relaxing getaway away from the crowds, Lustica could be an absolute haven for you. It's only 15 - 30 minutes from Tivat or Kotor (depending where you stay) and you really feel like you're a world away from everything. There are some great places to stay here. There aren't many hotels here but you'll find lots of apartments, villas and b&bs. The Bay of Kotor side of the peninsula is very developed and it's generally very busy. There are little stores and restaurants, but the closest supermarkets are a 10 - 15 minute drive away. The Adriatic side of the peninsula is a lot less developed and you'll have a more remote, village feel. It can be a 15-30 minute drive to the nearest shops and restaurants. Wherever you stay here, you'll need a rental car because there's no public transport to Lustica. 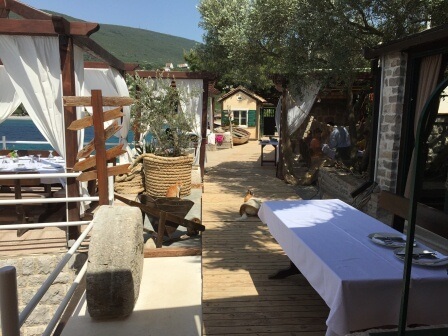 Maestral in Krtole is a top quality restaurant with tables set on a waterfront terrace that has views over to Tivat and the islands in between. Lunch or dinner there is accompanied by the restaurant's namesake - the maestral breeze from the south that refreshes you. The quality of the food is always excellent and you can arrive by road or boat and moor it to the terrace. Address: Obala Djurasevici, Krtole. See on map. Unassuming from the entrance, and easy to drive past!, Vino Santo is synonymous with quality in these parts. The waterside restaurant does excellent traditional Montenegrin seafood specialties like black risotto, octopus, calamari and whole bass. Everything is topped off with tasty garlic and parsley olive oil and a squeeze of lemon. You can't go wrong at Vino Santo. Address: Krtoli bb, Tivat Municipality 85320. See on map. 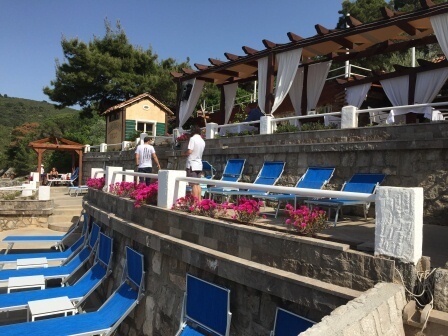 Ribarsko Selo in Zanjice is the ultimate in relaxed sophistication on Lustica. 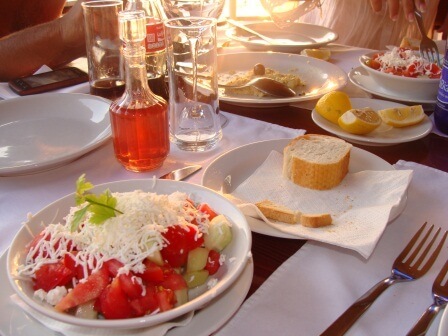 Ribarsko Selo (meaning Fisherman's Village) is a restaurant right on the waterfront at Zanjic. 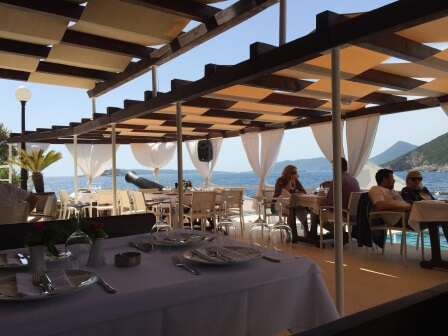 They serve Montenegrin-style seafood and the menu varies depending on the season and catch of the day. You can hire large day beds which are perfect for a lazy afternoon of sunning and relaxing. Address: Zanjice, Herceg Novi Municipality. See on map. Podgorica Airport: 95km or a 2 hour drive. Tivat Airport: 11km or a 15 minute drive. Dubrovnik Airport (Croatia): 63km or a 2 hour drive (plus 2 border crossings). We recommend hiring a car if you're staying on Lustica Peninsula. You can can get away without one if you're staying along the Bay of Kotor side up to Krasici and your accommodation is right on the coast, near the sea. If you're anywhere above the main road you should hire a car because the terrain is very steep and walking up and down in 40 degree (100F) heat isn't fun. There is a bus connection from Tivat to Krasici, so you would have bus links (see timetable below) and you can use taxis. Along this stretch you'd also be likely to have beaches, restaurants and convenience stores within walking distance. If you're staying anywhere other than Krasici, you should hire a car. There is a bus that goes as far as Krasici along the Bay of Kotor side of the peninsula. Here's the timetable for each stop and you can see the bus stops on the map. Pastrovici: 6.30am, 8.15am, 11.30am, 1pm, 2.15pm, 6pm, 8pm, 9pm, 11pm. Maslinjak: 6.33am, 8.18am, 11.33am, 1.03pm, 2.18pm, 6.03pm, 8.03pm, 9.03pm, 11.03pm. Krasici Kod MZ: 6.36am, 8.21am, 11.36am, 1.06pm, 2.21pm, 6.06pm, 8.06pm, 9.06pm, 11.06pm. Staro Naselje: 6.38am, 8.23am, 11.38am, 1.08pm, 2.23pm, 6.08pm, 8.08pm, 9.08pm, 11.08pm. Sokobanja: 6.40am, 8.25am, 11.40am, 1.10pm, 2.25pm, 6.10pm, 8.10pm, 9.10pm, 11.10pm. Bijelila: 6.41am, 8.26am, 11.41am, 1.11pm, 2.26pm, 6.11pm, 8.11pm, 9.11pm, 11.11pm. Kaludjerovina: 6.48am, 8.30am, 11.48am, 1.18pm, 2.33pm, 6.18pm, 8.18pm, 9.18pm, 11.18pm. Obala Dzurasevica 2: 6.50am, 8.32am, 11.50am, 1.20pm, 2.35pm, 6.20pm, 8.20pm, 9.20pm, 11.20pm. Obala Dzurasevica 1: 6.52am, 8.34am, 11.52am, 1.22pm, 2.37pm, 6.22pm, 8.22pm, 9.22pm, 11.22pm. Kruzi Tok: 6.59am, 8.41am, 11.59am, 1.29pm, 2.44pm, 6.29pm, 8.29pm, 9.29pm, 11.29pm. Ina Plin: 7.05am, 8.46am, 12.05pm, 1.35pm, 2.50pm, 6.35pm, 8.35pm, 9.35pm, 11.35pm. Zupa (Tivat main bus depot): 7.08am, 8.49am, 12.08pm, 1.38pm, 2.53pm, 6.38pm, 8.38pm, 9.38pm, 11.38pm. Tivat Ul. Palih Boraca (Tivat centre): 7.12am, 8.53am, 12.12pm, 1.42pm, 2.57pm, 6.42pm, 8.42pm, 9.42pm, 11.42pm. The timetable is the same every day of the week. The departures at 8pm, 9pm and 11pm only run from 1st June to 31st August. Outside of 1st June - 31st July, there is only one bus on Sundays departing Pastrovici at 8.40am. Tivat Ul. Palih Boraca (Tivat centre): 7.30am, 10.45am, 12.30pm, 1.48pm, 3pm, 5.15pm, 7pm, 8.30pm, 10.30pm. Zupa (Tivat main bus depot): 7.33am, 10.48am, 12.33pm, 1.51pm, 3.03pm, 5.18pm, 7.03pm, 8.33pm, 10.33pm. Ina Plin: 7.35am, 10.50am, 12.35pm, 1.53pm, 3.05pm, 5.20pm, 7.05pm, 8.35pm, 10.35pm. Kruzni Tok: 7.41am, 10.56am, 12.41pm, 1.59pm, 3.11pm, 5.26pm, 7.11pm, 8.41pm, 10.41pm. Obala Dzurasevica 1: 7.48am, 11.03am, 12.48pm, 2.06pm, 3.18pm, 5.33pm, 7.18pm, 8.48pm, 10.48pm. Obala Dzurasevica 2: 7.50am, 11.05am, 12.50pm, 2.08pm, 3.20pm, 5.35pm, 7.20pm, 8.50pm, 10.50pm. Kaludjerovina: 7.52am, 11.07am, 12.52pm, 2.10pm, 3.22pm, 5.37pm, 7.22pm, 8.52pm, 10.52pm. Bijelila: 7.56am, 11.11am, 12.56pm, 2.14pm, 3.26pm, 5.41pm, 7.26pm, 8.56pm, 10.56pm. Sokobanja: 7.57am, 11.12am, 12.57pm, 2.15pm, 3.27pm, 5.42pm, 7.27pm, 8.57pm, 10.57pm. Staro Naselje: 7.59am, 11.14am, 12.59pm, 2.17pm, 3.29pm, 5.44pm, 7.29pm, 8.59pm, 10.59pm. Krasici Kod MZ: 8.01am, 11.16am, 1.01pm, 2.19pm, 3.31pm, 5.46pm, 7.31pm, 9.01pm, 11.01pm. Maslinjak: 8.04am, 11.19am, 1.04pm, 2.22pm, 3.34pm, 5.49pm, 7.34pm, 9.04pm, 11.04pm. Pastrovici: 8.07am, 11.22am, 1.07pm, 2.25pm, 3.37pm, 5.52pm, 7.36pm, 9.06pm, 11.06pm. The departures at 5.15pm, 8.30pm and 10.30pm only run from 1st June to 31st August. Outside of 1st June - 31st July, there is only one bus on Sundays departing Tivat Ul. Palih Boraca at 12.30pm. So where will you go on Lustica Peninsula? Will you seek out back to basics solitude or will you enjoy the comforts of a luxury beach experience? Lustica offers you the best of both worlds!